The Kids Place is a fun, creative, interactive art studio for children of all ages. Make a gift or make something special for yourself. 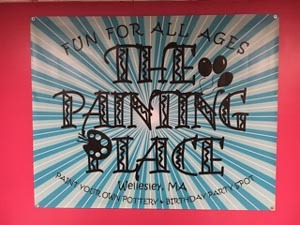 We offer 6 project choices: Paint Pottery; Plaster or Canvas; Make Candles and Mine for Gems; Birthday Parties; Classes; Workshops; Vacation Camps; Story Time; Adult Paint Night. Walkins always welcome!! You can drop in 7 days a week 10am - 6pm, Thursdays 10am - 9pm. The space is bright, colorful and always a fun place to be. There is no right way or wrong way to create art :) Come in to have fun, be creative make the mess here! Projects are priced as marked no additional fee. We are located in Needham Center. If GPS isn't picking up the 15 Highland PLACE please enter 1450 Highlad Ave. If you are dropping in for an activity and no birthday party is scheduled you can ask for he disco lights to be turned on for free bonus dance party!